This evening was the “Fall Festival” at the elementary school where I teach STEM in Yukon, Oklahoma, sponsored by our PTA. This is a big fundraiser for us, and I think may be our biggest money-making opportunity of the year. This year I agreed to organize and run a “Green Screen photo booth.” Students and parents could come by and choose a fun background for a whimsical picture, and dress up (optionally) with a variety of hats and other accessories if desired. This turned out to be a big hit, I had non-stop customers tonight from 6 to 8 pm throughout the entire event! I setup the same green screen equipment ($140 from Amazon) we’ve been using this year in our STEM “Maker’s Studio.” I used one of our STEM cart iPads and the $3 app “Green Screen by Do Ink.” It’s SO easy to use and SO forgiving with a less-than-perfect green screen lighting setup. 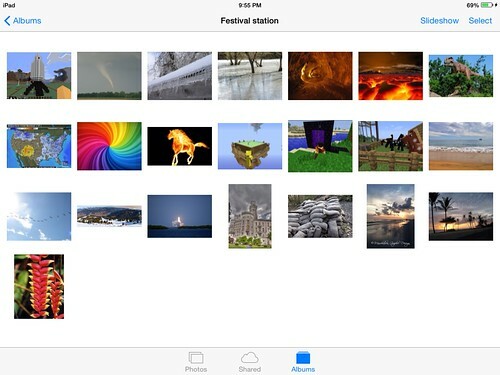 I downloaded a variety of photos to use as background images from MorgueFile, and also included some MinecraftEDU screenshots my students have been using in Maker Studio. 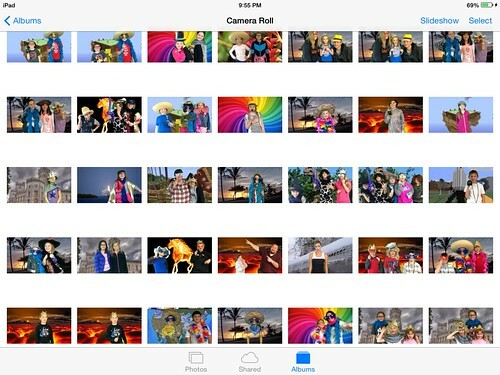 When students came to the festival booth tonight, I showed them the photos (in their own iPad Photos gallery) and let them select the one they wanted for their green screen photo background. The most popular images were probably a picture from Hawaii, a picture that looked like it was lava in a volcano, and the MinecraftEDU screenshots. In all, I ended up taking 128 photos of festival attendees. There are LOTS of fun ones! All the photos are available in a free album on Walgreeen’s photo website, which I setup in advance. I created the following flyer to give students and parents after they took a green screen photo tonight. 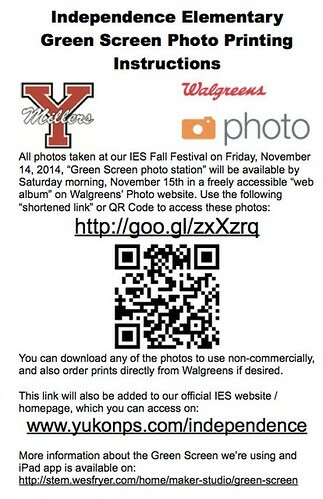 It includes a link and QR code to the Walgreens photo album where they can download photos or order prints, as desired. Everything went very well overall in our “green screen photo booth.” The only thing I might change next year is to use a newer iPad. The camera resolution on our iPad2’s seems very limited now, given the much higher resolutions available in newer smartphones. 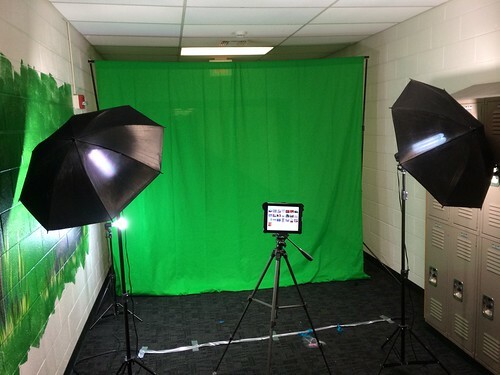 Next time you’re planning a PTA school carnival, consider offering a “green screen photo booth!” Since we already had the green screen, iPad and iPad app, this was a free booth to put together and offer! It was a lot of fun! If you haven’t already, you DEFINITELY should check out and use the “Green Screen” iOS app by Do Ink. It’s “magical,” to use the parlance of Steve Jobs! Hat tip to Lucie deLaBruere (@techsavvygirl) for convincing me to play with green screens more last summer at the “Create, Make & Learn” STEM Institute in Burlington, Vermont! 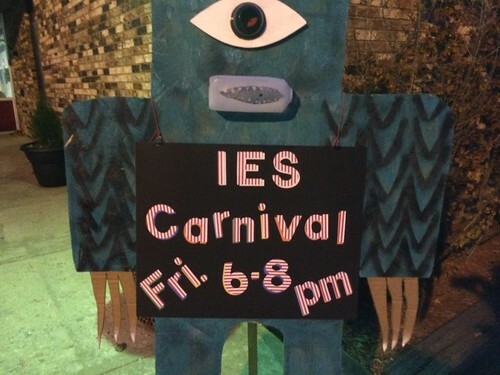 Without those positive experiences with other teachers, tonight’s IES fall festival green screen booth would never have happened! Wes, I lived in South Beach from 2007-2010. You were in my back yard! Okay, well it was the Atlantic Ocean, but hey….